For many years, the pattern for sport fishing on the west coast of Vancouver Island has the month of June scheduled to fire on all cylinders, providing great angling opportunities for most of the Tofino area's predominant saltwater species. Freshwater anglers are also somewhat hesitant to put away the waders and lighter tackle just yet, as local streams and lakes can be alive with hungry Trout, as well as a small number of Steelhead that enter various small local river systems through June and July. Every calendar year, June is the month of transition from spring to summer. For B.C. 's fishing calendar, June is when plans are made and memories unfold, while fishing opportunities all over the province turn from great, to excellent, and even “world class”. There is obviously good reason why the month of June also plays host to B.C. 's Family Fishing Weekend all over the province. With the bulk of Tofino's recreational fishing focused on Saltwater action, and consistent numbers of transient Chinook and Coho salmon passing through local waters from April thru July, there is reason to question if the peak season has shifted to June and July, as opposed to the highlighted August fishery of past years. Though Coho salmon numbers have been impressive since mid May, many understand that the inshore Coho fishing only gets better as we approach August. The abundant and aggressive Silver Salmon feed hard in and around Clayoquot Sound, prior to migrating southward to various large watersheds. The peak Coho Fly fishing and light tackle action begins through mid June, and stays consistently strong through mid September. The outside waters offer Chinook salmon fishing that will be reliable and steady for the season's largest Salmon species, but the sheer numbers of transient Salmon and Halibut in the earlier part of the season have definitely encouraged anglers to consider the season's best opportunities are now earlier than later. Along with the popular Salmon fishery, various species of Bottom fish help create a colourful mix to the experience. Offshore Salmon numbers during this time are unrivalled for the remainder of the season, aside from the waves of Coho that feed for extended periods within the prime habitat of Clayoquot, offering B.C. 's premier saltwater Fly fishing experience. There is no doubt that the West Coast of Vancouver Island offers B.C. 's most consistent early season fishery and Tofino is right in the middle of all the action. Regardless of age or experience, big boat, small boat or no boat at all, Tofino's varied fishing options should be highlighted on your calendar this June. Jay Mohl is a Tofino fishing guide. 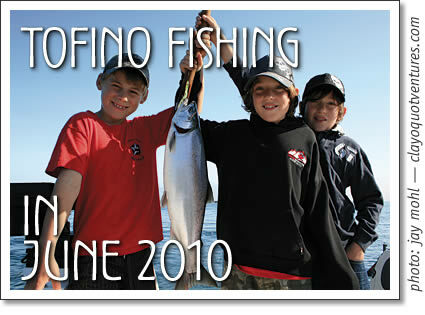 For more information contact him at tofinofishing.com or visit his new Tofino location on the left just past RPM. Tofino fishing report for Tofino, Ucluelet and Clayoquot Sound by Tofino fishing guide Jay Mohl for Tofino Time Magazine in June 2010.